Weight: On average the Angora rabbit weighs 3kgs. Colors: They come in white, golden, fawn, smoke, blue, black and chinchilla. The Angora Rabbit is easily recognised by its long, soft hair, which can grow up to 15cm in length. Due to their distinctive hair, Angora Rabbits can often seem to resemble a ball of fluff. Angora Rabbits have powerful back legs. They come in white, golden, fawn, smoke, blue, black and chinchilla. 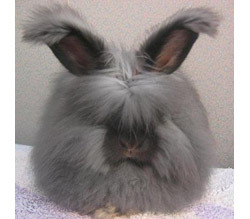 There are different sub breeds of Angora Rabbits such as; English, Giant, French and Satin. Angora Rabbits are the oldest domestic rabbits. Most Angora Rabbits are calm and docile but they should be handled carefully. They are most lively at dawn and dusk. Angora Rabbits are suitable pets for children if they are prepared to give them the grooming they need. Rabbits can become trained to learn their name. They are more intelligent than guinea pigs and hamsters. They can even be trained to go to the toilet in one specific area, which makes cleaning up after them much easier.